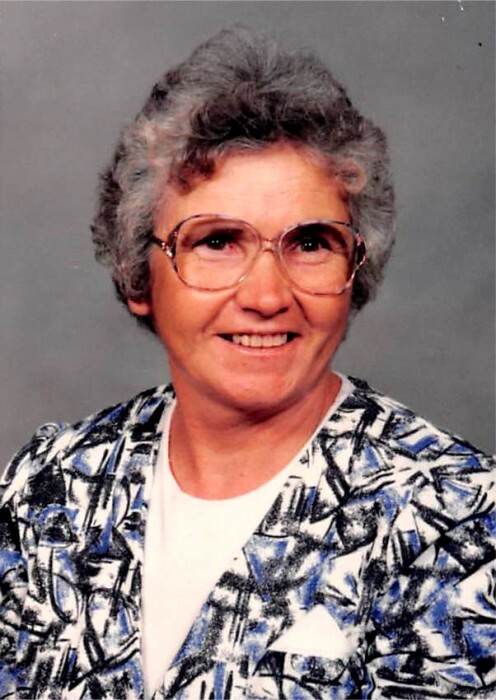 Sylvania A. Jones Spencer, age 80, of Spencer-Gabbert Lane in Waynesburg, Kentucky, passed away Sunday, October 14, 2018 at her residence. Born Tuesday, July 26, 1938 in the Dice Community of Perry County, Kentucky, she was the daughter of the late Andrew & Nannie Fugate Jones. Sylvania was the widow of the late Earl J. Spencer whom she married December 20, 1955 and preceded her in death October 7, 2004. She was a homemaker. Sylvania was an active member of Double Springs Baptist Church, where she loved attending, served as secretary for the Adult Women’s Sunday School Class, and help in the kitchen for Senior Citizens luncheons every month. Sylvania leaves behind three sons, Donald E. Spencer (Melinda) of Carol Stream, Illinois, Steven J. Spencer (Jannie) of Goochtown, Kentucky, and Woodie G. Spencer (Phyllis) of Waynesburg; one daughter, Lori Ann Vickers (Richard) of Waynesburg; 10 grandchildren, Brentley Spencer, Kayla Noel Spencer, Sylvania LeAnn Wright, Donald Earl Spencer, Jr., Earl James Spencer, Zarra Reagan, Michelle Shelton, Kelly Barnett (Jason), Monica Avera (Richard), and Kevin Floyd (Erin); 15 great-grandchildren, Brenlee Reagan, Dale Reagan, Allie Ann Reagan, Kelsey Shelton, Timmie Shelton, Caleb Spencer, Courtney Spencer, Stella Spencer, Tate Avera, Isabelle Avera, Tabitha Shelton, Shelby Barnett, Michael Barnett, Ryan Floyd, and Mia Floyd; three brothers, Robert Jones (Deva), William Jones (Juanita) and Ernest Jones (Ona) all of Waynesburg; one sister, Rose Mae Childers of Waynesburg; and three sister-in-law’s, Glenna Jones of West Alexandria, Ohio, Mary Jones of Hazard, Kentucky, and Lola Barnett of LaGrange, Kentucky. In addition to her husband and parents, Sylvania was preceded in death by one grandson, Daniel Spencer; four brothers, Earl Jones, Mirda Jones, Amos Jones, and Kelly Barnett; and three sisters, Effie Jones, Amy Jones, and Eva Smallwood. A Funeral Service will be held 11:00AM Wednesday, October 17, 2018 at Barnett, Demrow & Friend Funeral Home with Bro. Jerry Martin officiating the service. Burial will follow in Double Springs Cemetery. Timmie Singleton, Jason Barnett, Donald Spencer, Jr., Earl Spencer, Gary Singleton, and Doug Jones will serve as Active Pallbearers. Members of the Adult Women’s Sunday School Class at Double Springs Baptist Church will serve as Honorary Pallbearers. The Visitation will be held 5-8PM Tuesday, October 16, 2018 at the funeral home. Memorial Contributions suggested to Adventures in Missions, c/o LeAnn Wright Mission Fund, P.O. Box 742570, Atlanta, GA 30374-2570. You can also donate at https://leannwright.myadventures.org/. Barnett, Demrow & Friend Funeral Home, Waynesburg, is entrusted with Sylvania’s arrangements. Guest Book at www.friendfuneralhomes.com.